Welcome to the Web site for The DITA Style Guide: Best Practices for Authors, a book for technical communicators working within the Darwin Information Typing Architecture. The book is published by Scriptorium Press, a specialist publisher for the technical communication industry. The author is Tony Self, a technical writer with 30 years experience, based in Melbourne, Australia. As more companies implement DITA to streamline the development of technical content, the demand for DITA-literate technical communicators is growing. 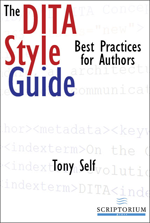 The DITA Style Guide: Best Practices for Authors provides comprehensive, practical explanations of DITA elements and attributes. Real-world examples and clear recommendations show you how to create consistent, semantically correct DITA content. The cover price of the printed book is $35.95 (US), but some Internet bookstores offer a discounted price and promotions such as free shipping. The cheapest currently seems to be $25.97 (US) at buy.com (with free US shipping). For buyers outside the US, the Book Depository offers the best price after shipping is considered (GBP21.71 including shipping). You can also special order a copy from your local bookstore. A Kindle edition of the book is available from Amazon (for $9.99 US), and an ePUB version (also $9.99 US) can be bought directly from the Scriptorium Online Bookstore! See what Sue Woolley thought of The DITA Style Guide in her review in the Issue 24 of Southern Communicator.